Time has flown since we left Shisha Pangma ABC exactly one week ago,Â and I cannot believe I am already en route to Islamabad, where I will be working for the Swiss Humanitarian Aid for one month. The events of the past two weeks seem almost blurred and it is always surprising, how quickly we get back into our routine in our normal lives. Sergey, the Russian, and I arrived back in Kathmandu on 30th September while our other team members stayed on the mountain for another three days as they were hoping to scale a nearby 7,000m peak from Camp 2. However, as the weather was not kind to them they had to abandon their plan and the only thing that was left for them to do was to pack up the gear they had deposited in Camp 2 and 1 and leave the mountain. Miss Hawley was of course happy to see me back in Kathmandu earlier than expected as most Manaslu and Cho Oyu expeditions were returning in the first week of October. When I rang her from Shisha Pangma Camp 2 and told her that I was coming back early she responded: “I told you Shisha Pangma was not a great feather in anyone’s crown.” However, she certainly sounded relieved that I did not get caught in the avalanche and that I was going to be back in time to help her with the interviews. Both Cho Oyu and Manaslu were incredibly successful this season and while the wind was blowing wind onto the slopes on Shisha Pangma, it blew the snow off Cho Oyu. “I could literally watch how the mountain was being cleared of snow,” Hans Honold, a Bavarian mountain guide for Kobler & Partner, told me. 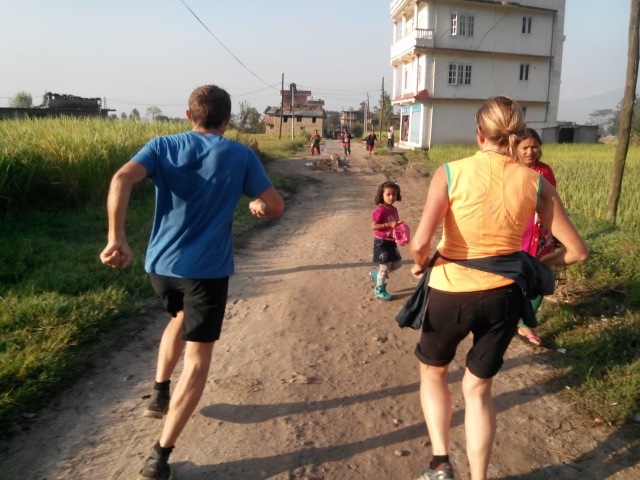 The last week was spent trying to get back into running again (I always feel incredibly week after an expedition to an 8,000m-peak), catching up with friends and whizzing around Kathmandu on my bike trying to find the expeditions that were coming back from their adventures. While the season for the big mountains is now over, expeditions are arriving for smaller hills such as Ama Dablam, Himlung and Putha Hiunchuli. And now it is time to dive into a different world again as I am going back to Islamabad (or Islamagood as some of my friends call it) for one month. I am still feeling dazed and I am not quite sure whether my mind has arrived where my body has landed,Â but I am excited to take up a new challenge with theÂ cooperation office of the Swiss Development Agency. This time around I will be training a young lady, who has been hired as the communications person in the office there and I hope that I can teach her someÂ from the little knowledge I have. It will also be amazingÂ to see friends again and I can’t wait to go back to the Margalla Hills to do my daily runs there. AndÂ if there is some demand, I might even rent a studio again to do my CORE classes. So, watch the space for some news from Islamagood! Marghalla Hills is undoubtedly a great workout . Dear Billi, It’s great to me: you came back safe and healthy, the most important thing… waiting impatiently to see you in Iran!